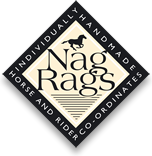 NagRags is a manufacturer of co-ordinated horse and rider wear and cross country colours. Every item is made by hand to customer order at our workshop in Lancashire. We are unique; we make each item as though it were for ourselves. We have tried and tested designs to choose from but we're also happy to help you to design bespoke items and then we'll transform that dream into a reality.